Posted 6:43 pm by Jonny Pigg & filed under Random. 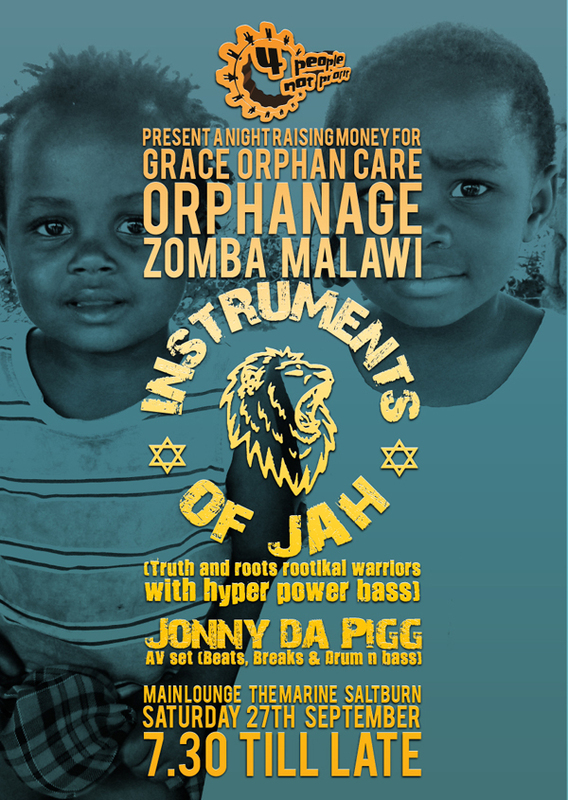 Saltburn‘s social justice party starter‘s return on Saturday 27th September for a special fundraising night for Grace Orphan Care an Orphanage in the Zomba region of Malawi. We will be downstairs in The Marine from 7.30pm till late and as ever, is completely free. 4 People Not Profit founders Justin York and Jay Jackson visited friend and fellow Saltburner Rob Reynolds in Malawi earlier this year where Rob is using his skills as a nurse for Voluntary Services Overseas (VSO) in a village hospital. While we were there we visited Grace Orphan Care in the Zomba region of Malawi. The Orphanage is run by a local man named Ernest whose passion and enthusiasm was evident from the moment we met him. Ernest founded Grace Orphanage which does much more than look after children who have lost their families to HIV/AIDs. Ernest and his team educate nursery age children themselves, pay school fees and some of the children have even gone on to University- a rare and great achievement for anyone without wealth in Malawi. For those children that are not so academically inclined Ernest is trying to set up a project to teach these children a skill or trade such as tailoring. As well as supporting children the orphanage feeds local elderly, disabled and ill people, it’s a real community project and anyone that needs support will be helped as much as is possible. One of the things that impressed us most about Ernest was his drive to become sustainable. We were never asked for money and Ernest stressed he was not looking for hand-outs. Just implemented was the purchase of a maize milling machine which is not only for use when milling maize grown themselves but also renting the use of the machine to local villagers to generate income for the Orphanange. Apart from rebuilding the kitchen damaged in the rain and other maintenance issues the next plan is to build a guesthouse in the grounds to generate more income to sustain and maintain the Orphanage. Malawi does not have the same structure and support for those in need as we have here in the UK so facilities like Grace are greatly needed. This is where you guys come in, please come down to the event and give generously to make these ideas a reality. If you can’t make it on the night but would like to donate please contact us by our facebook page. On to the fun stuff…….. Headlining this special night will be one of Middlesbrough’s most awe inspiring bass heavy reggae dub sound systems the mighty Instruments of Jah. They make a welcome return to the 4 People Not Profit stage after their amazing performance at our Christmas gig last year. Supporting will be Jonny Da Pigg returning with a special AV set providing a visual feast to go along with his unique brand of beats, breaks and drum n bass. If this wasn’t enough we will also have a raffle with fabulous prizes donated by local Saltburn businesses. So tell all your friends and family and get down and don’t forget to bring your dancing shoes. Sorry old gig somehow didn’t get posted here.